Occupation: cookbook author, educator, "domestic scientist"
The publication of Fannie Farmer's 1896 cookbook, The Boston Cooking-School Cook Book, was an event in cooking history and in making domestic life a bit easier for family cooks, most of whom were women: she included very specific and accurate measurements. Before that cookbook, ingredient lists were estimates. "Your results will vary" was a phrase yet to become popular, but it sure described the older style recipes! Just as Marion Cunningham has in recent years edited the Fannie Farmer Cookbook so it can be revised to take into account newer preparation techniques and newer dietary preferences, so Fannie Farmer herself was adapting an older cookbook. Fannie Farmer's parents, active Unitarians, lived just outside Boston. Her father, John Franklin Farmer, was a printer. Her mother was Mary Watson Merritt Farmer. During her high school years in Massachusetts, Fannie Farmer (who never married) suffered a stroke with paralysis, or perhaps was stricken with polio. She had to discontinue her education. After recovering some of her movement and being confined to bed for months, she worked as a mother's helper, where she learned her interest in and aptitude for cooking. With her parents' support and the encouragement of her employers, the Shaws, Fannie Farmer studied cooking under Mary J. Lincoln at the Boston Cooking-School. Lincoln published the Boston Cooking-School Cook Book, used in cooking schools which were at the time primarily aimed towards training professional cooks who would be servants to the upper middle class. The rising middle class, and the rise in the number of women who wanted to treat homemaking as their domestic profession -- in other words, more seriously and scientifically -- also found the cookbook useful. Fannie Farmer graduated from Lincoln's school in 1889, remained as assistant director, and became director in 1894. Her personality helped to draw students to the school. Fannie Farmer revised and reissued the Boston Cooking-School cookbook in 1896, with her improvements. She standardized measurements and thereby made the results more dependable. The standardization of measurements in household cooking was a great advance to home cooking, and made food preparation easier for those who had not devoted time to attend cooking school. 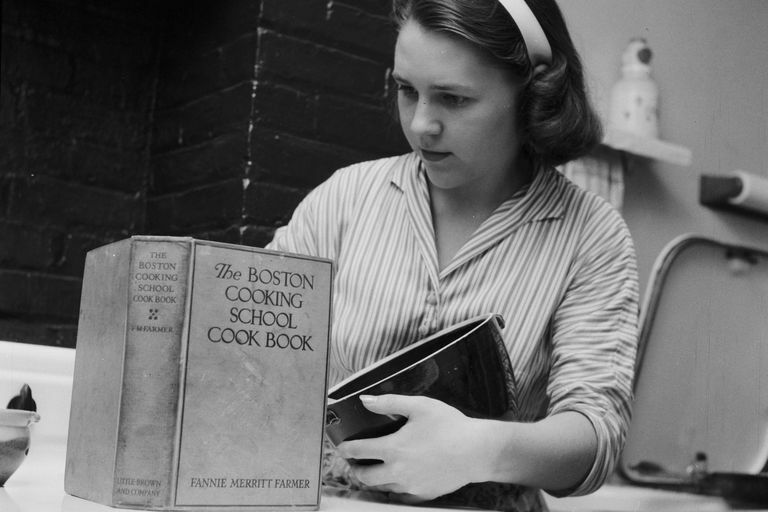 In 1902, Fannie Farmer left the Boston Cooking School to open Miss Farmer's School of Cookery, aimed not at professional cooks but at training housewives. She was a frequent lecturer on domestic topics, and wrote several more cooking-related books before she died in Boston in 1915. The school continued until 1944. • With the progress of knowledge the needs of the human body have not been forgotten. During the last decade much time has been given by scientists to the study of foods and their dietetic value, and it is a subject which rightfully should demand much consideration from all. • I certainly feel that the time is not far distant when a knowledge of the principles of diet will be an essential part of one's education. Then mankind will eat to live, be able to do better mental and physical work, and disease will be less frequent. • Progress in civilization has been accompanied by progress in cookery. The Fannie Farmer Cookbook, Marion Cunningham. Hardcover, September 1996.